When we last left off, I’d just arrived in Beijing to the biggest culture shock yet. Let’s see if it got better – this was supposed to be the wildest spring break of my life! We got up on Thursday morning to a much brighter scene (sleep helps all); the day before Beijing was cloudy and yellow, but that day the sun was out, and our first order of business was to book overnight train tickets to Shanghai, which we would be flying out of at the end of our trip back to Shenzhen. We first tried our hostel’s booking service, and after learning it would cost $200 RMB more than what the guidebooks said was average for a “soft sleeper” ticket, we huffily went over to the train station sure the hostel was trying to rip us off. Turns out, the weekend we wanted to go to Shanghai was Easter weekend (which wasn’t a big deal in China), but it also happened to coincide with “Mass Ancestor Worship” weekend that year (which was a big deal), so train tickets were more expensive than normal. Oh. Nuts. Clued in to this revelation (and no one spoke enough English to help us secure seats), we went back to the hostel and promptly booked tickets through our friendly hostel employee (Anne?) who turned out to be one of our most valuable resources in Beijing. 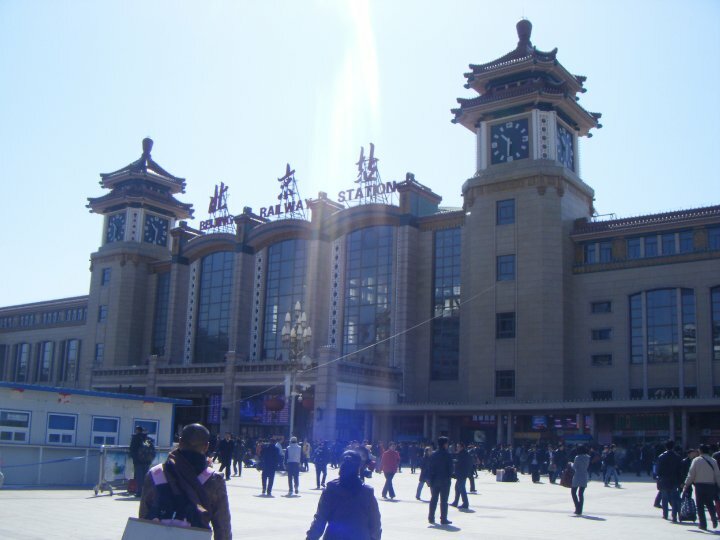 The Beijing Train Station. Save yourself the trouble and let your hostel book tickets for you – no one in there spoke English. Not only did she assist in booking our tickets, but wrote out addresses for us in Chinese to give taxi drivers, called restaurants to get addresses and prices, and was just a lifesaver overall. I still wish I could thank her properly for her all her help. After that initial drama, we finally headed out to see Beijing properly. The first stop was Lama Temple, the oldest and most accurate Tibetan temple outside of Tibet. 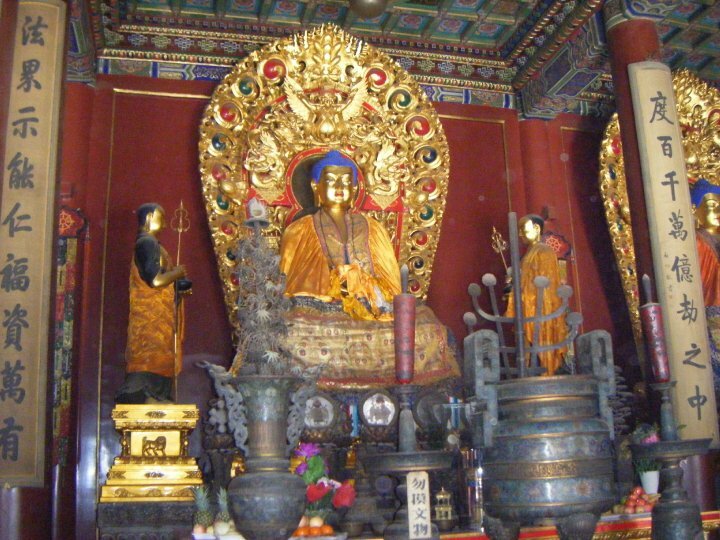 One of many Buddhist shrines within Lama Temple. It was quite impressive and housed, among other things, an 18 meter high Buddha (I literally couldn’t see the top of it inside the temple) and a throne that the Dalai Lama actually sat on when speaking to the Chinese. After that, we followed Lonely Planet’s advice and wandered aimlessly to find the best dumpling place in all of Beijing, Niu Ge. 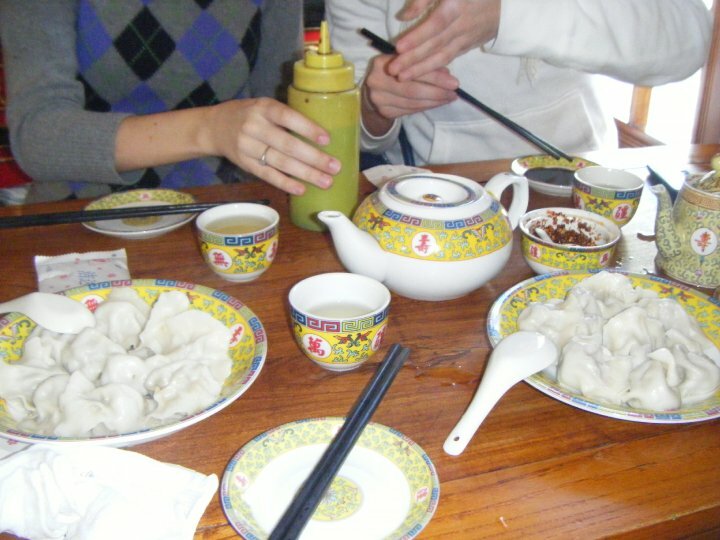 It was this tiny little restaurant near Tiananmen Square, but the dumplings were to die for! And the Bible didn’t lie. We ordered the dumplings the book recommended along with a couple of random ones we pointed at on the menu, and we could actually watch the women making them by hand right behind our table in the “kitchen.” They were absolutely the most delicious dumplings I have ever tasted (especially the mutton and onion flavors – we ended up requesting two orders of those). Hands down some of the best dumplings I’ve ever had. We came back more than once. Then we revisited Tiananmen Square during the daytime (much less intimidating), watched the ceremonial lowering of the flag, and after sunset took the subway to the Olympic Station and saw the Watercube and Bird’s Nest from the 2008 Beijing Olympics in the dark. Absolutely breathtaking! I would never in my wildest dreams have imagined I’d see them up close and personal at night. Just fantastic. To end the day, we went to another LP recommended restaurant (LP really saved us this entire trip) famous for its shredded pork “burgers” (shredded pork stuffed into a fresh, warm bun – like an English muffin almost) and mutton kebabs, and then collapsed back at our hostel. A much more successful first full day in Beijing. 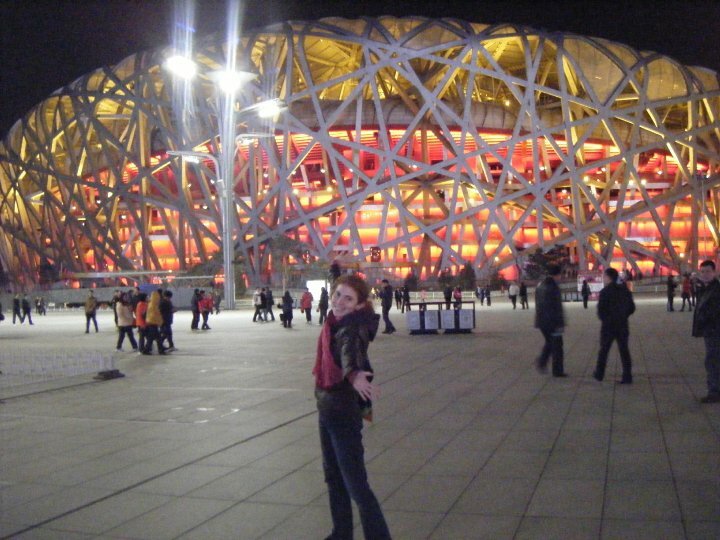 The Bird’s Nest used in the 2008 Summer Olympics. Can’t believe I was there in person. 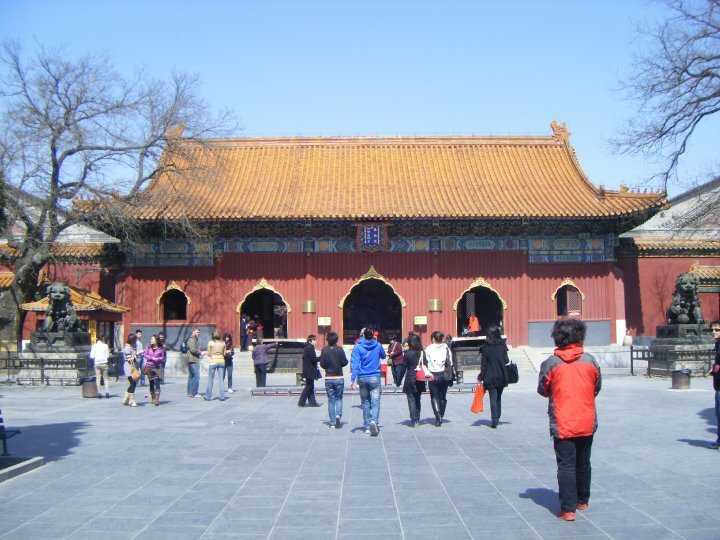 Friday, we did the Forbidden City – for five hours! That place is SO much bigger than I ever imagined. We all rented personal audio guides that would talk and tell us different things about the many, many, many temples as we reached them on foot. The only fly in the ointment for that day was how freaking cold it was in the city… oh, and the tourists too. Millions of tourists swarming all over the place! Still, we walked all over, heard about the different emperors and their many wives and concubines and what they did in their free time, and soaked up Chinese history. What kind of trouble you ask? You’ll just have to wait for my next post to find out. Don’t miss it, it’s a good one I promise! 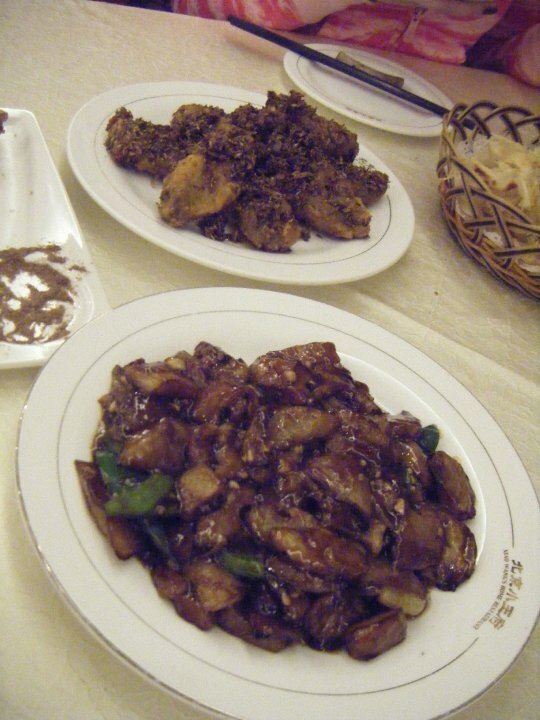 Aubergine – if only America could do eggplant this well. 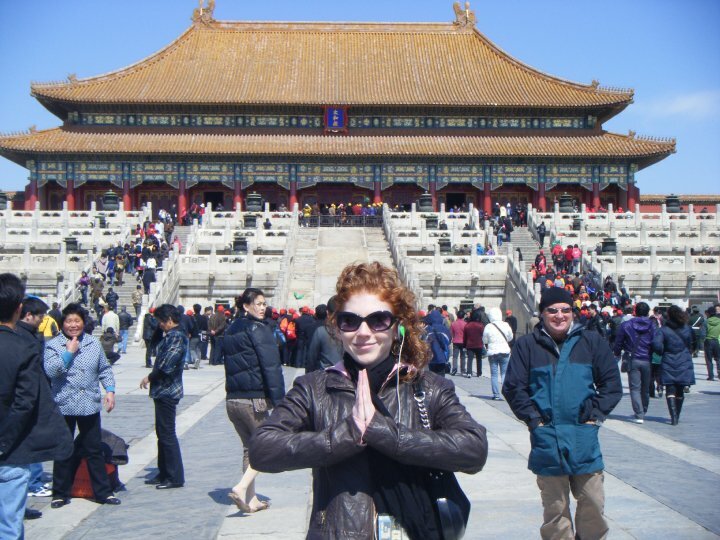 This entry was posted in Asia, China and tagged Asia, Beijing, China, Dumplings, Forbidden City, Panda, Spring Break, Travels on April 2, 2014 by Paige N..